Time and Work is an important chapter from banking examinations point of view. 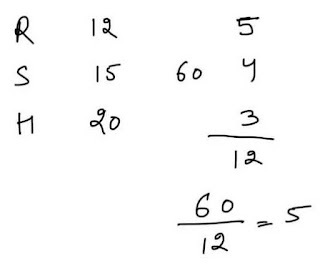 Today I am going to share simple tricks to solve questions from this chapter. I have already shared efficiency shortcut with video to solve questions from this chapter here. Step 3. The LCM from Step 1. will be the total work . Divide the total work with the outcome of Step 2. Ram , Shyam and Mohan can do a piece of work in 12,15 and 20 days respectively, how long will they take to finish it together . Step 2. 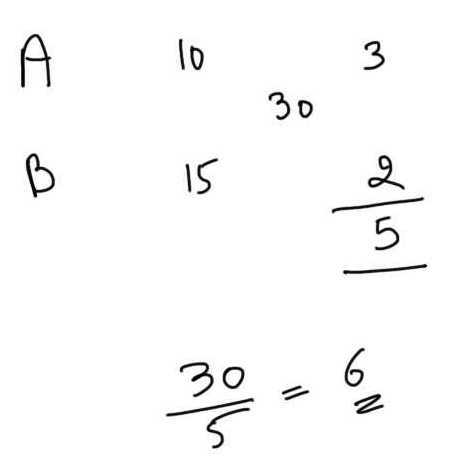 Divide 60 by (each number)12,15 and 20 ,you will get 5,4 and 3 respectively. 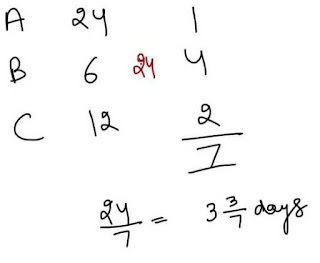 Now you get Ram's work in one day is 5 or 1/5 .Shyam's one day work = 4 or 1/4 and so on. Step 3. 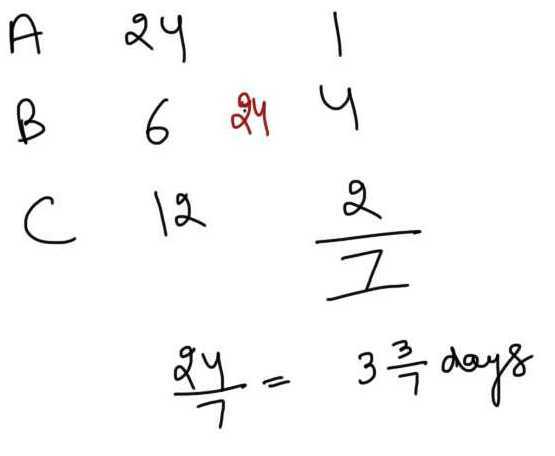 Now add Each Men's 1 day work (5+4+3) which 12. Now here 12 is Ram , Shyam and Mohan together's 1 day work. Step 4. Now Divide 1 day's work with Total work ( 60/12) , you will get Total time taken by them to do the same work which is in this case is 5 days. 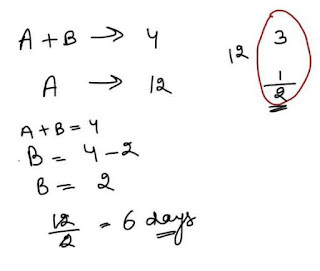 A and B together can complete a piece of work in 4 days. If A alone can complete the same work in 12 days, in how many days can B alone complete that work ? Step 2. Divide 12 by (each number)4 and 12 ,you will get 3 and 1 respectively. Now you get A and B's work in one day is 3 or 1/3 . A's one day work = 12 or 1/12 and so on. Step 3. Now Subtract their work (3-1) you will get 2. Step 4. 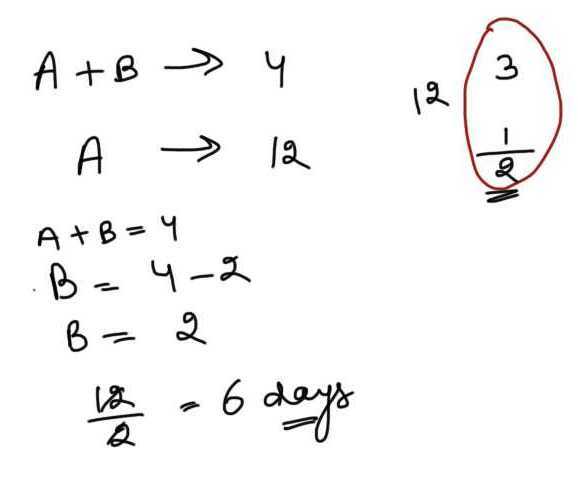 A and B done the work in 4 days .Now by placing the value of A . you will get the B's work which is 2 days. Step 2. Divide 30 by (each number)10 and 15 ,you will get 3 and 2 respectively. Now you get A's work in one day work is 3 or 1/3 . B's one day work = 2 or 1/2 . Step 3. Now add Each Men's 1 day work (3+2) which 5. Now here 5 is A and B together's 1 day work. Step 4. Now Divide 1 day's work with Total work ( 30/5) , you will get Total time taken by them to do the same work together which is in this case is 6 days.